The excitement is growing as we expect the new 2016 Ford Focus RS in Myrtle Beach SC in early 2016! The new Focus RS will be built in Germany and will arrive here in America in Spring 2016. Here at Beach Automotive, we can hardly contain our excitement and we’re counting down the days! 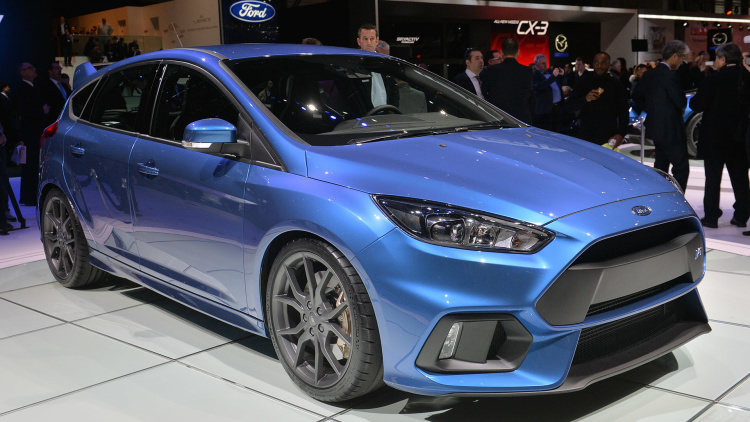 The new 2016 Focus RS promises the ultimate combination of high performance and innovative technology. Available in four awesome colors, the 2016 Ford Focus RS is based on the 2.3L EcoBoost®. This is the same engine that powers the newMustang EcoBoost. This engine pledges more than 315 horsepower and a new low-inertia single turbocharger twin-scroll direct injection. It will feature Ford Performance All-Wheel Drive with Dynamic Torque Vectoring. This will combine phenomenal traction and grip with impressive agility. Can’t forget the cornering speed and acceleration too. The optimized six-speed manual transmission will blow your mind! That’s only a little bit of what’s under the hood. On the outside, The 2016 Ford Focus RS will have standard 19-inch matte magnetic alloy wheels with Michelin Sport summer tires. It will also have an option for 19-inch low-gloss black forged alloy wheels with Michelin Pilot Cup Sport 2 summer track tires. On the inside, the highly styled interior will reflect the high-performance character of the Focus RS. Partial leather-trimmed RECARO® sport front seats, a flat bottomed leather wrapped steering wheel and aluminum pedals will make you feel like you’re in a true race car right on the track. The 2016 Ford Focus RS will also feature a suspension that will allow the driver to choose between a sport ride or a more comfortable ride experience as well as RS Drive Modes that allow the driver to choose between Normal, Sport, track or Drift Modes. It will also feature a rear-view camera, a Sony® Audio System with 10-inch speakers and sub-woofer for your favorite road trip music and SYNC® 3 technology that will only be available on select 2016 models. So as you can tell, the new 2016 Ford Focus RS is going to be an awesome new addition to the Ford line-up. It will not leave you disappointed. Keep checking back for more updates, new information about a release date and when we’ll be able to schedule your test drive. We can’t wait to personally introduce you to the new 2016 Ford Focus RS in Myrtle Beach!